The following seven fundamental characteristics of hunger-gatherer diets will help to optimize your health, minimize your risk of chronic disease, and lose weight. Higher protein intake - Proteing comprises of 15% of the calories in the average Western diet, which is consideralbly lower than the average values of 19-35% found in hunter-gatherer diets. 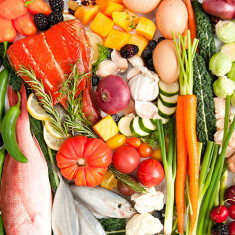 Meat, seafood, and other animal products represent the staple foods of modern day Paleo diets. Lower carbohydrate intake and lower glycemic index - Non-starchy fresh fruits and vegetables represent the main carbohydrate source and will provide for 35-45% of your daily calories. Almost all of these foods have low glycemic indices that are slowly digested and absorbed, and won't spike blood sugar levels. Higher fiber intake - Dietary fiber is essential for good health, and despite what we're told, whole grains aren't the place to find it. Non-starchy vegetables contain eight times more fiber than whole grains and 31 times more than refined grains. Even fruits contain twice as much fiber as whole grains and seven times more than refined grains. Moderate to higher fat intake dominated by monounsaturated and polyunsaturated fats with balanced Omega-3 and Omega-6 fats - It is not the total amount of fat in your diet that raises your blood cholesterol levelsand increases your risk for heart disease, cancer, and type 2 diabetes, but rather the type of fat. Cut the trans fat and the Omega-6 polyunsaturated fats in your diet and increaes healthful monounsaturated and Omega-3 fats that were the mainstays of Paleo diets. Recent large population studies, known as meta analyses, show that saturated fats, have little or no adverse effects upon cardiovascular disease risk. High potassium and lower sodium intake - Unprocessed, fresh foods naturally contain 5 to 10 times more potassium than sodium, and Stone Age bodies were adapted to this ratio. Potassium is necessary for the heart, kidneys, and other organs to work properly. Low potassium is associated with high blood pressure, heart disease, and stroke - the same probles linked to excesssive dietary sodiu. Today, the average American consumes about twice as much sodium as potassium. Net dietary alkaline load that balances dietary acid - After digestion, all foods present either a net acid or akaline load to the kidneys. Acid producers are meats, fish, grains, legumes, cheese, and salt. Alkaline-yeilding foods are fruits and veggies. A lifetime of excessive dietary acid may promote bone and muscle loss, high blood pressure, and increased risk for kidney stones, and may aggravate asthma and exercised-incuded asthma. Higher intake of vitamins, minerals, antioxidants, and plant phytochemicals - Whole grins are not a good subsitute for grass produced or free ranging meats, fruits, and veggies, as the contain no Vitamin C, Vitamin A, or Vitamin B12. Many of the minerals and some of the B vitamins whole grains do not contain are no well absorbed by the body.